Target Liberty: STOCKMAN: The Apprentice 2.0---You're Pardoned! STOCKMAN: The Apprentice 2.0---You're Pardoned! his pardon of Joe Arpaio. We happen to loath "identify politics" and have no use for the PC scolds who continuously pollute the mainstream media and are now gumming hysterically about the President's Friday night action. But let's be clear: the ex-Sheriff of Maricopa County is no hero, friend of liberty or object of sympathy owing to his age or alleged service to the country. In fact, he is an ornery misanthrope, bully and power-mad tyrant who well and truly deserves to wear a Federal prison jump suit for every day of the six-month term to which he would likely have been sentenced. His technical crime was the wanton, blatant and recurring violation of a Federal court order enjoining his department from racial profiling, but the underlying sin is the real crime. That is, he turned the Maricopa sheriff's department into a veritable vigilante operation focused on heavy-handed and often brutal enforcement of Federal immigration laws over which he had absolutely no jurisdiction. Worse still, his modus operandi involved military-style raids on places like hotels, restaurants, car washes, fruit farms etc. where workers were likely to be using false ID's or were undocumented. That's right. The self-named "America's Toughest Sheriff" was mainly in the business of eliminating the paychecks of low wage workers trying to feed their kids and nabbing law-abiding citizens whose Hispanic ethnicity was proof enough to him that they were illegals. He wasn't so much protecting the public safety against genuine thugs and criminals as he was showboating his anti-immigrant and authoritarian political platform. prisoners to take showers in scalding water, mandated that they wear pink underwear, banned cigarettes and coffee, provided no heat and scant clothing in the winter's cold and forced them to endure countless other deprivations and indignities. 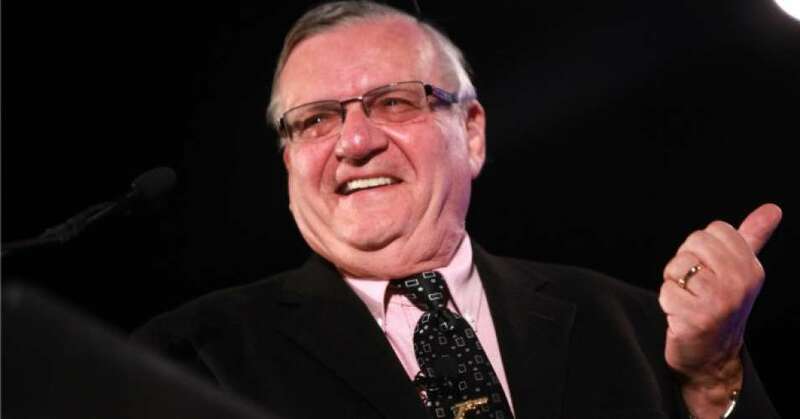 In a word, no believer in liberty and minimal government should shed a tear for Joe Arpaio because his ruthless and crude will-to power embodied the very opposite. He was and is the ultimate rogue politician who used the state's legal monopoly on violence to terrorize the citizenry with false fears and invented threats in order to secure their acquiescence to his rule. civil commerce, the state generates the very economic rents needed to finance an alternative, lawless black market apparatus of distribution. fears percolating across America would be vastly attenuated. After all, most s0-called illegals come here to work; it is mainly the hardened criminals who come here to service the drug trade----a scourge which was made in Washington DC and the state capitals, not Mexico and the tributaries which feed it. November for his 24-years rein of bully-boy law enforcement and vitriolic attacks on Hispanics and practically anyone else who disagreed with him-----including at one point most of the Maricopa board of supervisors, as well as any reporters intrepid enough to expose his misdeeds. defaulted to a dead-end strategy of rousing his base on all the wrong issues. So doing, he is inviting the jackals of the Imperial City to devour what remains of his presidency. It's almost as if Trump has a political death wish and can be counted upon to throw his political enemies new morsels of red meat whenever their appetites slacken-----even for the interregnum of a hurricane disaster. Indeed, the Donald was more than correct in noting that the violence and ugliness in Charlottesville emanated from "many sides" and that the black-masked, club-wielding, urine-bag throwing, anti-free speech thugs and ruffians of the Antifa were flat-out contemptible. Then again, the true purpose of the mainstream media's screeching, sanctimonious censure of his alleged "moral equivalence" sin was not that he put white supremacists and neoNazis on the same plane as the neo-Stalinist left that descended on Charlottesville looking for a violent clash with the former; it was just an excuse to carry their campaign to hound him from office to a new level of shrillness and outrage. demagogue---who didn't simply whistle the dogs, but unleashed them in full military regalia. And now the Donald has taken ownership of all that reprehensible baggage. Finance Debt machine-----and no fitness or capacity to govern an Imperial City that is predicated on their continuation. Yet post-Arpaio, the pathway ahead is becoming clearer. Like a rejected organ transplant, Trump is now well along the process of being rejected and ejected by the beltway and media elites who rule American politics. So in a desperate rearguard maneuver to keep the jackals at bay, he will increasingly turn to inciting and mobilizing the "base". immigration, terrorism, refugees, the PC Mafioso and the other bogeymen of the populist right. being thwarted by his own appointees thus far. Exclusive: Trump Vent in Oval Office, "I Want tariffs. Bring me some tariffs! nefarious doings of foreign governments and the stupidity of the Washington establishment and trade negotiators. And it will also mean that the true instigators of the massive offshoring of American jobs and shrinking living standards in Flyover America---that is, the Keynesian fools in the Eccles Building and their endless gifts of free money to Wall Street and to the C-suite financial engineers of corporate America----will have dodged a bullet again. At least for now. The following is a rare account of President Trump in a small Oval Office meeting, venting at senior staff for sometimes resisting his hawkish trade agenda This account — confirmed by sources with knowledge of the meeting and undisputed by the White House —hints at where Trump may be heading with his trade agenda. And it shows he believes some of his top economic advisors are resisting his agenda because they are "globalists." "China is laughing at us," Trump added. "Laughing." Kelly responded: "Yes sir, I understand, you want tariffs." Staff secretary Rob Porter, who is a key mediator in such meetings, said to the president: "Sir, do you not want to sign this?" He was referring to Trump's memo prodding Lighthizer to investigate China —which may lead to tariffs against Beijing. Trump replied: "No, I'll sign it, but it's not what I've asked for the last six months." He turned to Kelly: "So, John, I want you to know, this is my view. I want tariffs. And I want someone to bring me some tariffs." Kelly replied: "Yes sir, understood sir, I have it." At one point in the meeting, Navarro pulled out a foam board chart. Trump didn't pay attention to it, saying "I don't even know what I'm looking at here." Trump made sure the meeting ended with noconfusion as to what he wanted. Kelly broke up the meeting and said the group would work things out and reconvene at the appropriate time. folks against the "White House Democrats" who will likely pull out the stops to thwart the Donald's raging determination to go ahead with a global trade war. By the latter, we mean "Javanka" (Jared Kushner and Ivanka Trump) and their recruits from Goldman Sachs, Gary Cohn and Steve Mnuchin. That is to say, a trade policy bloodletting is now coming to the Donald's own household. "It seems as if there is no president in the US"
Yes, even the Finns get it, but what we have on Wall Street is an apparent head-in-the-sand resolve to keep mindlessly buying the dips, thereby proverbially wasting a good crisis. Well, until it is way too late. My understanding of the case against Arpaio was due to an initial court order that was vague. St Paul ignored that order. Then, the court issues another order without the ambiguity and clarifying the original order. Arpaio followed the second order but was taken to court for his challenge of the initial court order. That's not the case at all. The first injunction was very clear yet he openly and publicly defied it until the courts had enough of him. So after 21 days of hearings in 2015, Snow found Arpaio in civil contempt of court." Unfortunately, the sorry leftist media won't put the same scrutiny to Obama's pardons or Clinton's pardons of wealthy criminals. Those rich criminals weren't pulling taking innocent people from their cars or their homes for looking "illegul". The ONLY reason you're angry is because younderivwd a guilty pleasure from seeing an old fashioned thuggish sheriff roughing up people whose only sin is looking like the Frito Bandito. You might say the party and its leaders deserve that and more for being such unprincipled opportunists beholden to special interests, but like I said many times Trump is now the face of conservatism and capitalism in the eyes of many millennials and people who loathe him. He exists only because of the hatred some knuckle-dragging hicks harbor against immigrants, which some GOPers were too happy to take advantage of for their own gain. Cool Hand Luke was my initial impression of the fascist Sheriff Joe. Trumpussolini is even worse than I imagined. i would respectfully disagree with David. Parties? the party system is done. Trump is going to be President for the next 4 years max. anyone on seen yes prime minister? thats how it will be for the next 16 months. then after the midterms they will be many overseas tours then the new military industrial complex- Wall St candidate; rich, outsider of course and democratic and the democrats will fall all over themselves for them and nothing to do with the Clintons and the trump right wing years will be held up as a terrible example full of Nazis. St. Paul? Sheesh. Where did that come from. That was suppposed to be Arpaio. Why should a locally elected sheriff do what a federal judge tells him? The States have not granted any power to the Federal government to regulate local sheriffs. My understanding is that the people elect sheriffs to do something they don't want to do themselves, viz., defend their property and lives. If those people keep electing a non-liberty defending thug, is that not their prerogative? Which totally misses the point. Of all the people in federal prison that should be freed and pardoned, Trump pardons this clown. How dare he identify illegals? Don't we want all 7 billion from the 3rd world moving here? Arpaio "identified" so-called illegals like God identified his own after the cruzaders killed everyone after taking Béziers. Arpaio's goons were entering hotels and restaurants and other places of work like besiegers storm a keep, sowing fear on citizens and maybe a few undocumented alike.